Total Comfort's electrical professionals provide a wide range of services to our commercial and residential customers throughout Ormond Beach, Daytona Beach, Palm Coast, Flagler Beach, Port Orange, Deland, Ponce Inlet, New Smyrna Beach, and all of Volusia and Flagler County to keep your home or business safer or enhanced with indoor or landscape lighting. Our electricians provide a wide range of services for your home or business that include everything from wiring a new building to updating existing wiring or making your home or business more appealing with new lighting. Click Here for an in-depth view of our quality standby generators. Important News About the Fire Dangers of FPE Panels and Circuit Breakers. As a result of independent testing, FPE panels and breakers have been shown to be defective and present a safety and fire hazard. The following links to videos discuss this hazard. Total Comfort's Electrical Division is available during these regular service hours: Monday - Saturday 8am -5pm 24 Hour Emergency Service Available When you call outside of our service hours, a live person takes your call 24 hours a day. Our manager on call has access to a whole team to respond to your needs including sales and emergency situations. Hi I'm Michelle and I would be glad to assist you! 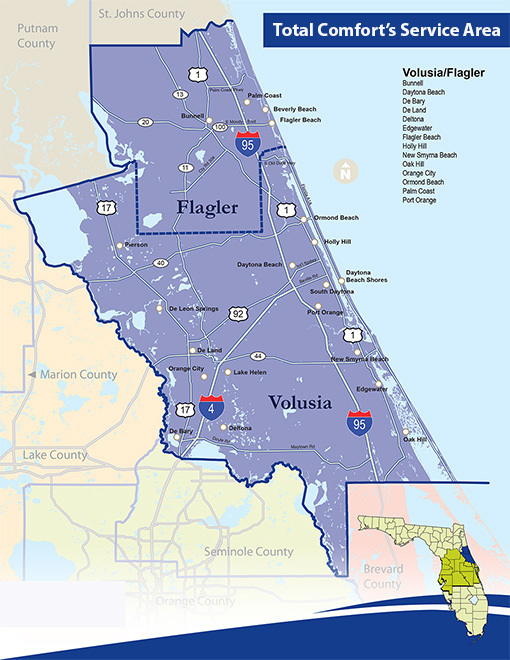 We serve Volusia and Flagler County including Ormond Beach, Flagler, Palm Coast, Bunnell, Daytona Beach, Daytona Beach Shores, South Daytona, Ponce Inlet, Deltona, Deland, Holly Hill, Edgewater, Port Orange and New Smyrna Beach. If you have a Federal Pacific electrical panel call us today for a free replacement estimate. Federal Pacific Electric panels have been found to be a possible fire hazard. Protect your home and family today. See the links on this page to fully explain the hazard. Total Comfort features quality generators from Carrier to provide you with the best protection in case of a power outage. Carrier's generators are available for use with natural gas or liquid propane and automatically power on within seconds of a power outage. Total Comfort uses quality products to help you: Automatically keep your home or business on standby power in case of power outage whether you are home or away with easy onsite usage standby generators.